The country is tropical. The monsoon rages for two months of the year and is an alternating combination of downpours and sunshine. 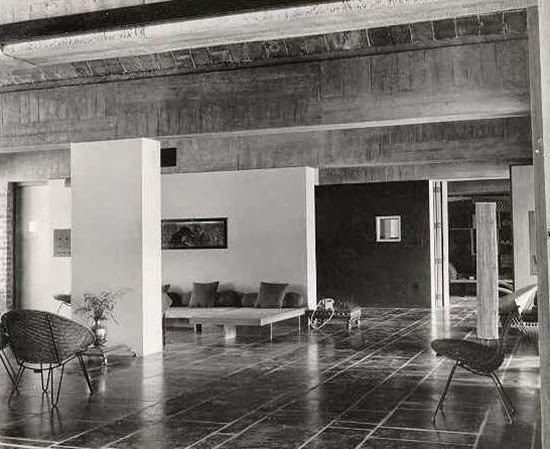 A western architect has spent his life learning his profession; to be sure he must apply his profession in India, but he must adapt it to antagonistic requirements: comfort is coolness, it is the current of air, it is the shade. And yet the sun must penetrate at the proper time, in the favorable seasons. Mosquitoes are everywhere and windows cannot be left open without special provisions being made. Whether it concerns housing, offices, or a palace, the conditions of the problem are dictated by a constant merciless sun with conditions of temperature, humidity and dryness varying from one month to another-ail contradictory factors. To play the role of a modern architect under these conditions is most easy. In a temperate country, in Paris, I have experienced the unamiable effects of the sun at certain seasons (summer) behind a sheet of glass. This glazing which is wonderful for ten months becomes an enemy during the dog-days. It thus becomes necessary to invent something. It was in my private atelier on the Rue Nungesser et Coli where I would suffer in silence (for a cause !) 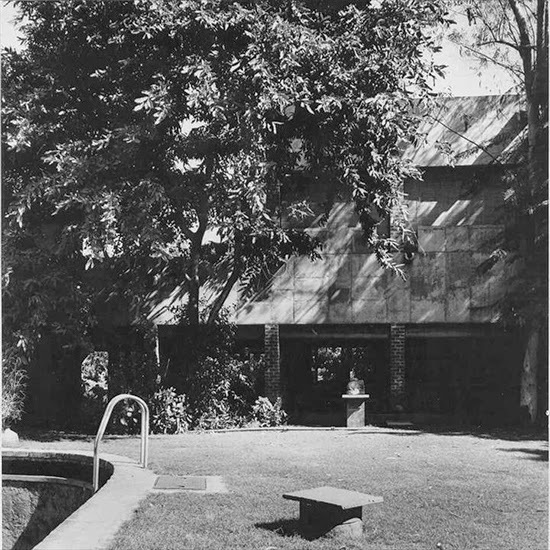 that I cast my eyes upon the brise-soleil, which I have conceived, which I have named and the term has become universal today: brise-soleil (sunbreaker). Universally recognized and exploited as well... even wrongly !!! For example, a building such as a recent airport in which a façade was embellished with imposing brise-soleil, but it was the north façade! In another airport, in the Orient, furnished with brise-soleil imitating those of the High Court of Chandigarh, the budget having been pared down ... they have reduced the depth of the brise-soleil !!! One can imagine the result! The pseudo-modern designer has provided himself with a ready-made motif to feed his plagiarizing pencil. 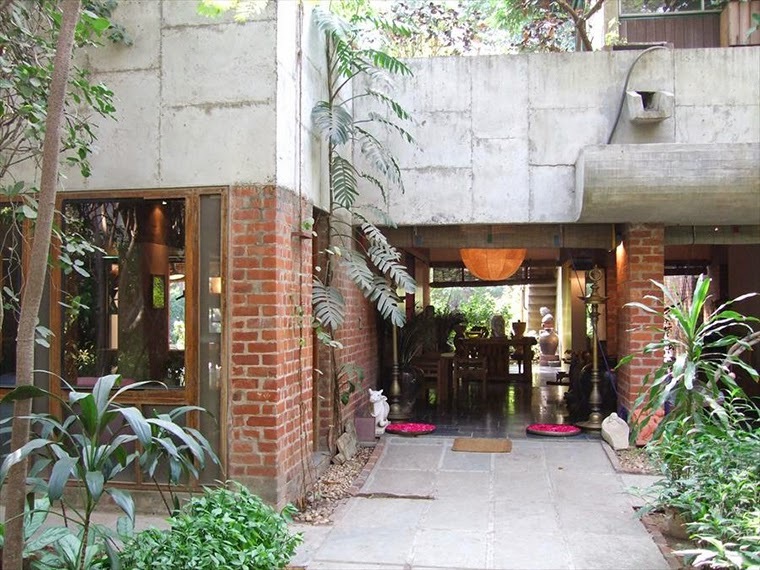 The Sarabhai house is situated according to the prevailing winds (in order to be traversed by currents of air), and its façades are furnished with brise-soleil. 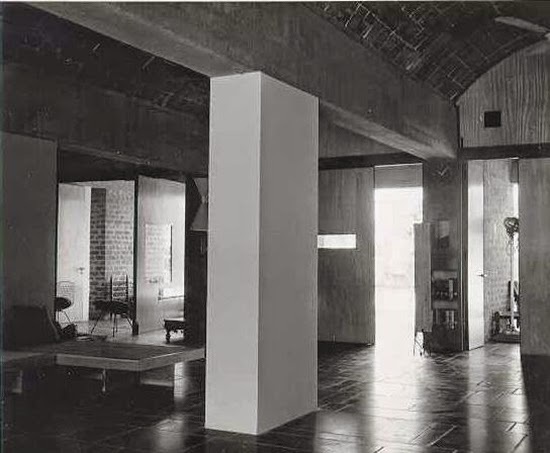 For the structure, Catalonian vaults: cradle-vaults of flat tiles set in plaster without formwork, coupled with a row of bricks cast roughly in cement. These half-cylinders are carried to the walls by the intermediary of a rough concrete lintel. The composition serves to create openings in these walls, ail parallel, playing solids against voids-but playing intensely the architectural game. Much research has gone into this house. One of the most brilliant solutions is that of the roof. 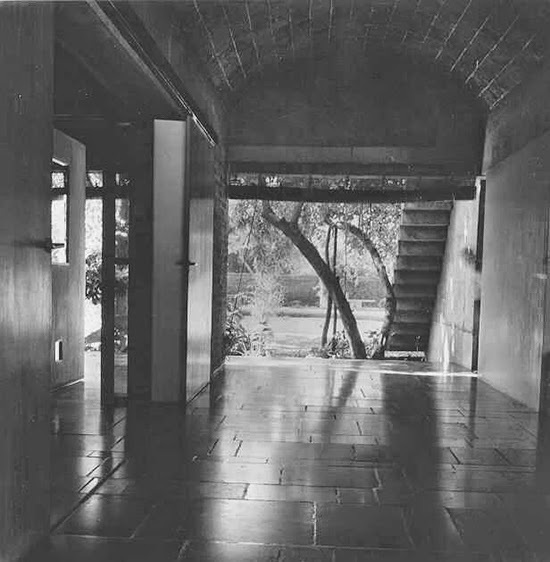 The half-cylinders of the vaults, once the waterproofing is assured, are covered with earth and the upper part of the house becomes a magnificent garden of lawn and charming flowers... which the architect-author of the plans would rather see sparse than excessive. The architect Le Corbusier has declared war, in principle, on those gardeners who, although having all good intentions, give a false impression of life in foisting only exotic plants upon us and multiplying to excess the plants called "rare", falsifying, falsifying... under the cover of Nature, falsifying even the atmosphere. 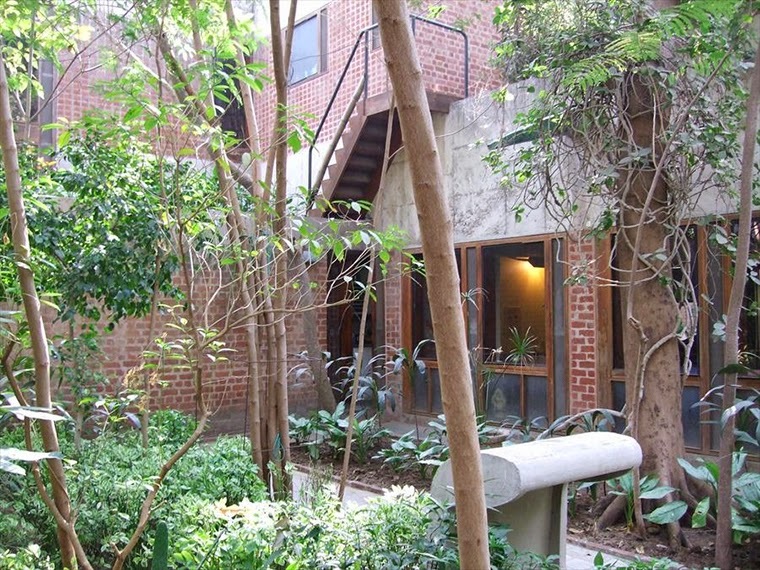 The photographs of the Manorama Sarabhai house were taken before the end of construction. Such are the hard brutal facts of "news pictures" ! 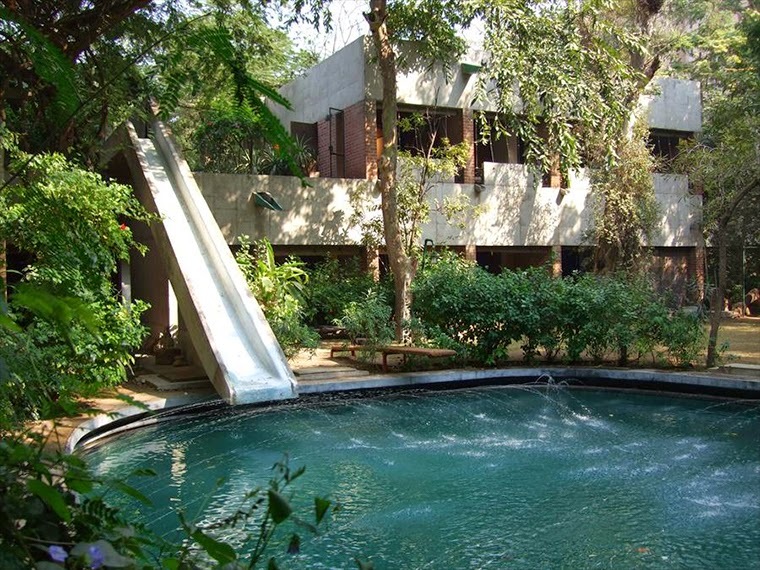 There is no Jack of admiration for a swimming pool at the foot of a majestic toboggan run, a pool reduced by the solicitude of an anxious mother to the role of a cooling basin for air-conditioning. It's a sad adventure for a toboggan to stick its nose into the bowl of a foot-bath. There would have been a better solution: to carry out the design of the architect-author of the project ! The beauty of the cylindrical Catalonian vaults would demand calm. Instead, for reasons of economy, they have fixed in place the great vanes of the ventilators which simply howl at the ceiling. Adjustable ventilators, capable of being oriented, should have been in their place.